As the title suggests, the book explores shifts in a range of business areas, including talent attraction, product innovation, sales and marketing, client feedback and satisfaction as well as crisis management. So much more than a marketing manual or how to do social media guide, it is a challenge to create a socially responsive organization. As one of the examples highlighted in the book eloquently puts it, “Conspire to commit progress!”. This is a call to action for the listening organization in the networked economy. For companies that want to build greater engagement with their people, their customers and their wider business communities. Get ready to read this book more than once. Different chapters will have you return to reread and download the additional resources included through very clever use of QR codes. Read with your Smart Phone handy and a tag reader at the ready. A link for a free tag-reader is even included in the first chapter. Run reading groups and brainstorming sessions with your employees who are keen to find ways for the company to flex it’s social intelligence. Encourage them to be both students and teachers of the Now Revolution. 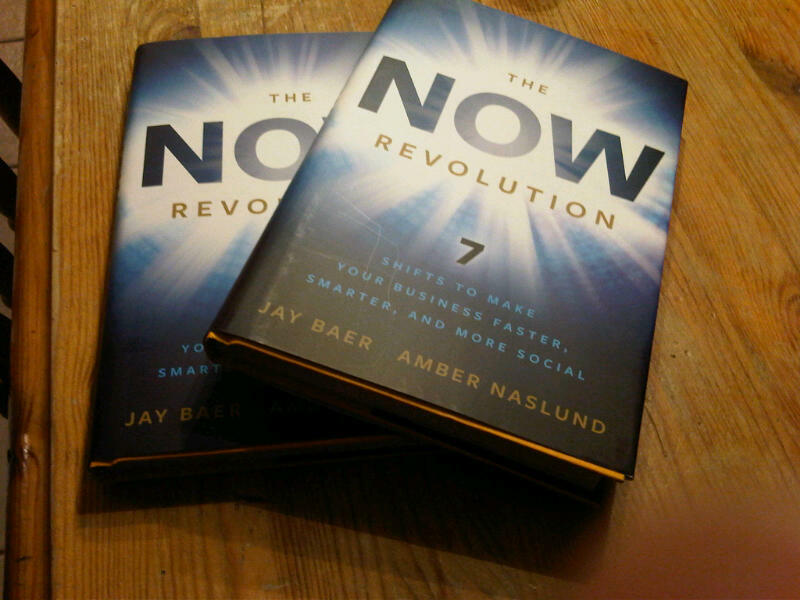 Send Amber or Jay a message on twitter @AmberCadabra or @JayBaer, including the hashtag #TheNowRevolution letting them know you have read the book and what you thought. They are absolutely living examples of the behaviours described in their book. Don’t take my word for it! Connect with them and find out for yourself. Thanks so much for this! And I love the suggestions you’ve got at the end of the post. Especially love the idea of penning a manifesto and sending a copy to clients to let them know about your goals to become a listening organization. Clever, clever! Really have appreciated getting to know you online, and your support of the book. Thank you so much for spreading the word. Hi Amber! I’m glad you liked the review. It truly is a great book. While the book tour and cross continent travelling is no doubt a blur, I hope you get some time to enjoy it ‘in the moment’ too. Hope to join you on that path one day! A very solid review, Gaby! One of the points made at #NOWYVR was that companies should hire based on passion, not on a resume. To become more social absolutely requires shared vision and passion at every level of an organization. When that kind of culture exists and consistently delivers on its brand promise, the tools and environment can change, but the business will thrive. Thanks so much. I love that you put next steps in your review. Fantastic!